In 1960 the economist Piero Sraffa published the book Production of commodities by means of commodities1, that would radically change the thinking about the macro-economic development. Notably the contents implies an effective refutation of the marginalist analysis of macro-economics, which until that moment was leading. The shock among the neoclassical economists was enormous. Even now, half a century later, still many neoclassicial economists suffer from a psychological repression, and prefer to simpy ignore the work of Sraffa. Especially the North-American economists have difficulty in facing the modern insights. For instance in the popular text-book Macro economics by N. Gregory Mankiw one searches in vain for a mention of the theory of Sraffa. Since this book is used as subject-matter for tuition at the Dutch universities, whole generations of students are formed in blissful ignorance. This shortcoming is the main reason to explain in the present column once again the ideas of Sraffa2. Your columnist undertakes this with some feeling of substituting shame. In addition to the disastrous implications for the neoclassical theory of macro-economics, the theory of Sraffa has also undermined the marxist labour theory of value. In the sixties of the last century this was an important feat of arms, because then the theory of Marx was still the state doctrine of the Leninist power block in Eastern Europe and in Asia. The marxist economists preferred the same way of acting as the present American economists, and conveniently ignored the discoveries of Sraffa. A wage-profit curve is derived on the macro-economic level. This provides for a clear illustration of the conflict of interests between the production factors labour and capital, which so intensely fascinated the classical economists like Adam Smith, David Ricardo and Karl Marx. It is shown, that the production factor capital is merely a fiction. For its calculation requires the summation of the values of the already present capital goods. And these values in turn depend on the chosen distribution of income, that is to say, the height of the wage level and the general profit rate. Therefore it is impossible to calculate the wages and the profits from the marginal products of the production factors, like the neoclassical theory attempts. To put it differently, the capital goods can not be aggregated in a meaningful way. The aggregation problem also undermines the marxist theory, at least its simultaneous variant. Also Marx assumes, that the total social capital is simply the sum of the values of the separate capital goods. Here he uses the labour theory of value to justify his assumption. Sraffa shows, that the labour theory of value leads to a wrong calculation of the prices, and thus of the capital3. The description is static, so that there is no room for the natural economic dynamics. The producers can only choose from the existing production techniques. The technological progress, and thus the innovation, are ignored. The growth due to the rising labour productivity is not included. Therefore the theory is not suited for descriptions of the long term4. There are no positive scale effects. A scaling-up does not change the proportions of production. The English expression for this neutrality is constant returns to scale. Incidentally this unrealistic assumption is found more often, for instance also in the neoclassical theory5. In this column the theory of Sraffa will be explained by means of a simple example, that is reproduced from the draft reader Vooruitgang der economische wetenschap, published in 2011 by Uitgeverij E. de Bibelude6. The example is an economic system with two branches. One is the agriculture, that is active in the production of corn (measured in bags). The other branch is the industry, and she produces metal (measured in tons, or to put it differently 1000 kg). Both branches use a part of the produced corn and metal for themselves as means of production (in the form of seeds for sowing, fuel, tools etcetera). Evidently each branch employs workers. Their wages are paid in advance in bags of corn (for bread, gin etcetera) and tons of metal (for domestic appliances etcetera). Concrete the branch for corn uses yearly qggmglg workers. He produces yearly Qg bags of corn. Likewise the means of production in the branch for metal are yearly qgm bags of corn, qmm tons of metal, and lm workers, and the production is Qm tons of metal. An analyses such as this one, which is restricted to quantities, is called an (open) Leontief-system. The wages and the profits are paid from the nett product. Table 1 shows the values, that will be used in the present example. Here the a's are defined according to agm = qgm/Qm etcetera. The a's are simply the scaling factors, that describe the proportional growth of the means of production in case of a rising production. Their magnitude depends only on the production technique, and therefore they are called the production coefficients. In a similar way one defines ag = lg/Qg and am = lm/Qm, and calls them the labour coefficients. The toal is called the technical coefficients of the system. Table 2 summarizes the values of the coefficients, as they are derived from the table 1. Note that in each equation of the system the indices of the coefficients are interchanged with respect to those in the system 2. The two equations 4a-b contain 3 unknowns, namely pg, pm, and w. The solution of this system requires a third equation. Sraffa proposes as a third equation to use one of the products as the unit good. Then this unit good plays henceforth the role of money, which can express the prices of the other goods. Take for instance pg=1. Then one finds the values pm and w, expressed in bags of corn. In fact the assumption pg=1 implies simply a division by pg of the left and right sides of the formulas 4a-b. To put it differently, actually pm/pg and w/pg are solved from the formulas 4a-b. The quantity pg is used here as the so-called numéraire of the system. where Δ = 0.2474 × (r-1.146)2 − 0.1396. This is precisely the wage curve of the system. 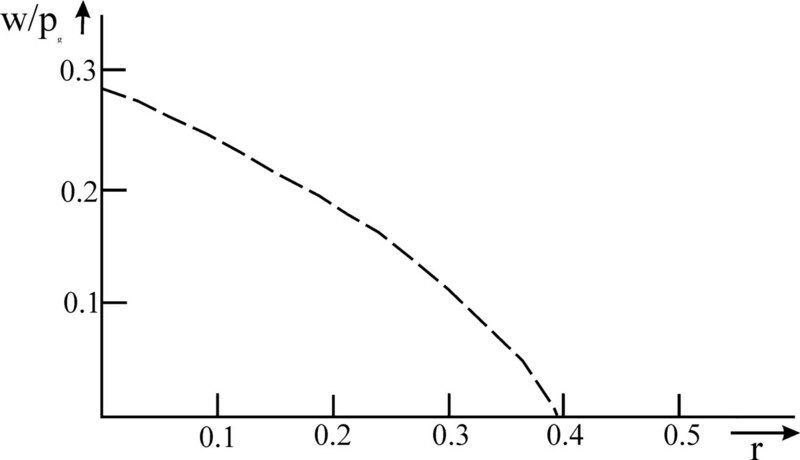 She shows how the nominal wage (expressed in the price of a unit of corn) varies as a function of the profitability r. In the point r=0.395 the wage level has fallen to zero, so that the whole nett product goes into the profit. If on the other hand the workers succeed in claiming the whole nett product, then the profit rate will be equal to zero. Then the wage is w=0.287×pg. Tt can simply be verified, that w/pg falls continuously for a rising r. This proves the conflict of interests between the workers and the producers (or the capital owners). It can also be derived from the formula 8, that the fall in the wage level accelerates, according as r increases. In other words, the second derivative of w/pg with respect to r is (also) negative. 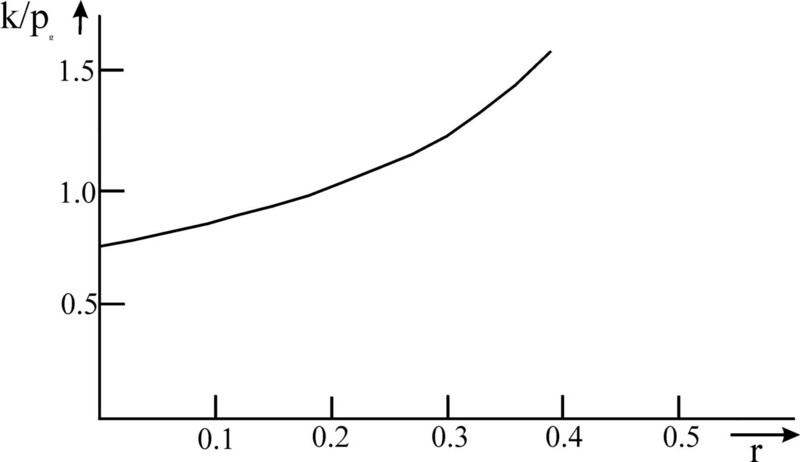 The course of the wage curve is show graphically in the figure 2. One sees how the curve as it were turns away its convex side from the coordinate axes. Such a course of a curve is called concave. The theory of Sraffa has the interesting property, that she shows how the product prices change, when the distribution of the nett product between the workers (wage) and the producers (profit) is modified. 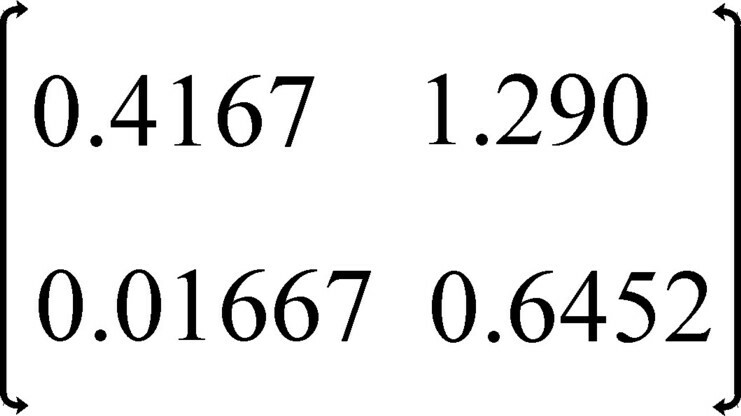 In the used example the formulas 7a-b show clearly, that the ratio pm/pgm/pg=6.251. And for r=rmax=0.395 the price ratio has become 18.03 9. Apparently in the case of a rising profit rate r the metal becomes relatively expensive with respect to the corn. This illustrates also the relative meaning of the nominal wage w, because it is not decisive for the real purchasing power. For a rising price of metal implies, that the workers can actually buy less metal with their wage w.
In the preceding parapgraph is it established, that the size of the ratio pm/pg depends only on the profitability r. According to the formula 9 this also holds for the capital intensity κ/pg, at least as long as the production technique is given and thus the technical coefficients are fixed. Your columnist forgoes the task to rewrite the formula 9 as a function of r. But the figure 3 does show, how κ/pg varies with r.
The figure 3 shows a surprising relation between the capital intensity and the profitability r. For it appears, that the capital intensity rises, when the profitability increases. This implies, that the producer invests more in capital goods for each worker, according as that same capital should yield a larger profitability. In a world with perfect competition one would expect just the opposite. For in that case the profit of enterprises on the macro-economic level is zero. Then the profitability is the price, which the producer must pay for the employment of the capital goods. One would expect, that in the case of a rising price of capital the producer would diminish his investments in capital goods per worker. For it becomes more attractive to substitute the factor labour in place of the factor capital. Such a behaviour is indeed precisely the functional coherence, that is expected on the basis of the neoclassical theory. In the neoclassical theory the expensive production factors are replaced by cheaper ones. Figure 3, and thus the theory of Sraffa, proves that the idea of the neoclassical theory is too superficial and wrong. With this the whole macro-economic interpretation of the neoclassical theory is refuted. Incidentally the theory of Sraffa shows, that the course of the capital intensity κ/pg as a function of r is dependent on the production technique, that the producers have chosen. There are also techniques, where the behaviour as predicted by the neoclassical theory does occur, and thus the capital intensity decreases for a rising profitability. Characteristic for this kind of techniques is, that the wage curve w/pg has a convex shape, or to put it differently, her convex side is turned towards the coordinate axes11. When the producers choose the productions techniques, it is not the relation between κ/pg and r that matters, but the realization of the maximal profit rate at a given wage level12. Finally it should be remarked again, that in the example just presented the change of the capital intensity is not caused by physical modifications. For at the start it has been stated, that the material system simply maintains itself (reproduction). The quantities qgg, qgm, qmg, and qmm do not change. The only thing that changes, is their value, at least as long as the distribution of the nett product varies. And for the producers only the value counts (and not the physical quantities), because the profitability is calculated on the basis of the value of capital. If more capital is invested (taken as a price sum), then they are obliged to produce more profit. The ratio pm/pg can be found by dividing the formula 7a by the formula 7b. Then on the right hand side of the equation the wage w drops out, so that the resulting expression depends only on r. (back).